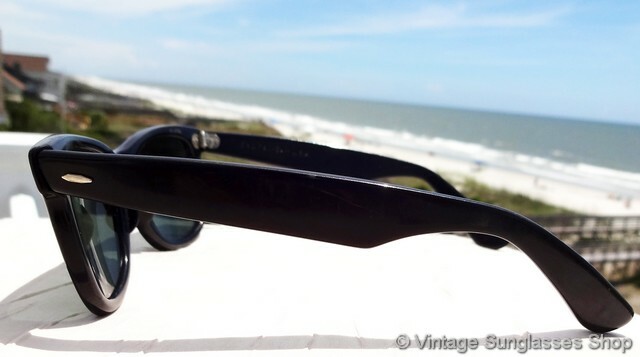 1 Vintage black ebony Ray-Ban Wayfarer sunglasses with Bausch & Lomb G-15 lenses are the original style of iconic Ray-Ban Wayfarers c 1950s - 1970s. 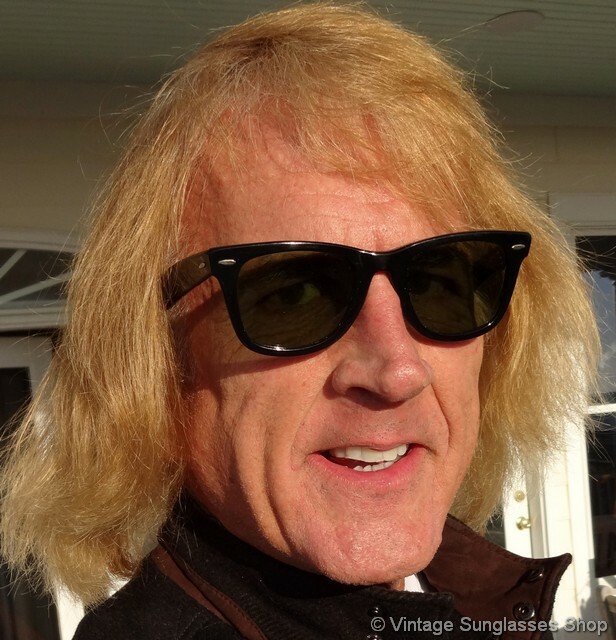 These are the same sunglasses popularized in such movies as The Blues Brothers with John Belushi and Dan Aykroyd and Risky Business with Tom Cruise. 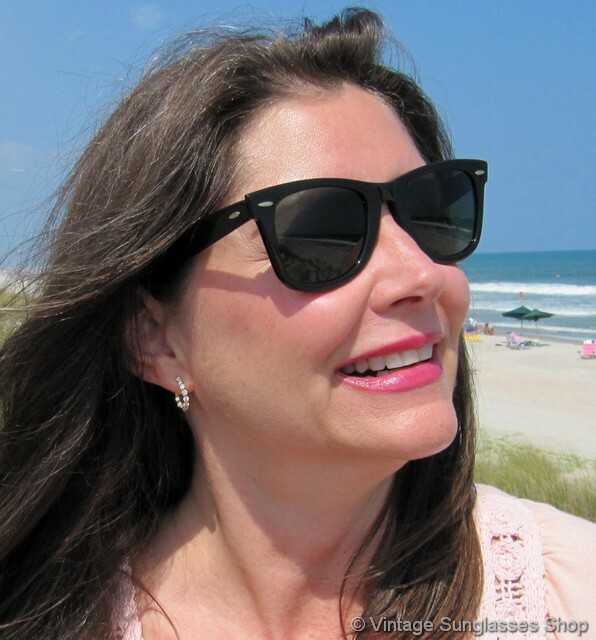 B&L G-15 lenses are the most popular and most prolific of any lenses they produced, so with the classic black Wayfarer you're getting all of the original design features of the classic. 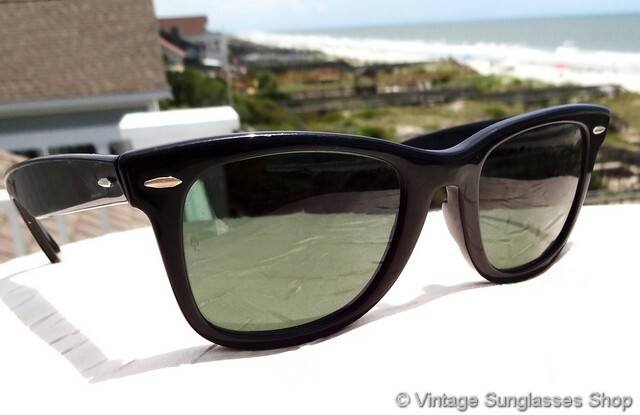 The unisex Ray-Ban Wayfarer frame measures approximately 5.375" temple to temple and lenses measure approximately 1.875" x 1.625" at the widest points with both lenses laser etched BL near the hinges on production after the mid 1970s but without from the 1950s to that time. The inside of one ear stem is impressed B&L Ray-Ban USA while the inside of the other stem is impressed Wayfarer. 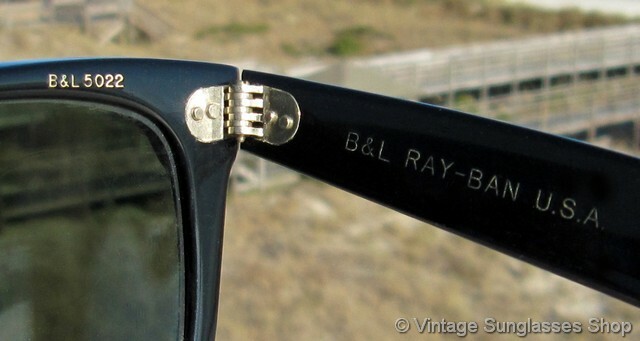 and B&L 5022 is impressed above the right lens on the rear of the frame, part of a top Sacramento, CA estate collection of early B&L Ray-Ban sunglasses. 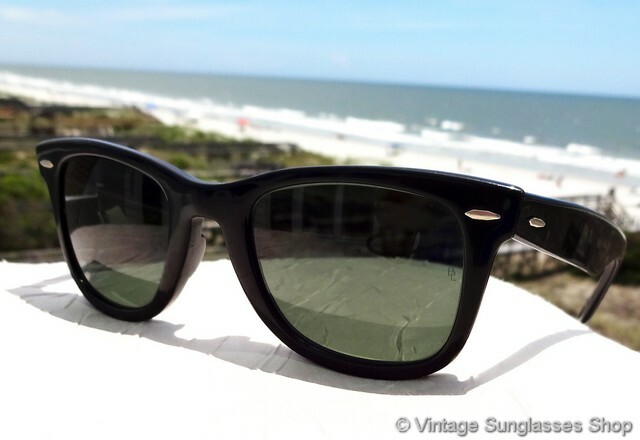 1A Step up another level beyond our already unequaled vintage condition standards with new old stock black ebony Ray-Ban Wayfarer sunglasses in mint, unworn condition. 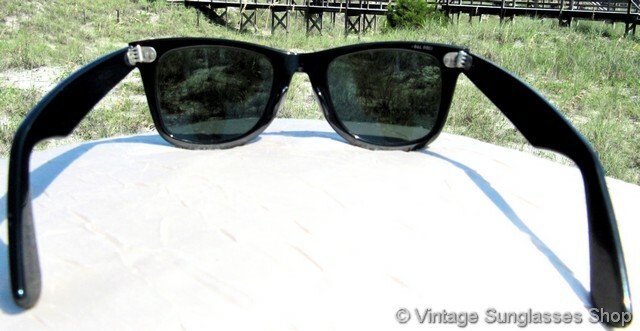 2 Vintage Ray-Ban L2009 Wayfarer sunglasses are slightly larger, idential in appearance but 2mm wider across the nose bridge for wider faces - this does not change the 50mm lens size but only the bridge. 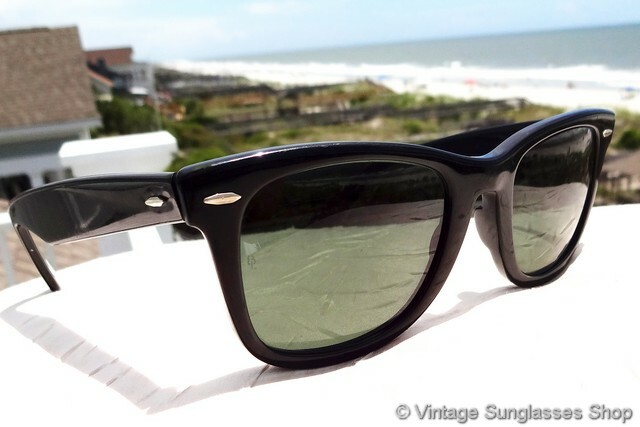 These Ray-Ban L2009 black ebony Wayfarer sunglasses are impressed B&L Ray-Ban USA on one ear stem and Wayfarer on the other stem, B&L 5024 is impressed above the rear of the right lens, and on some production L2009 YNAS is impressed on one ear pad. 3 SPECIAL DISCOUNT OPPORTUNITY! Sometimes when a great frame comes in as part of a lot but has lenses that don't quite meet our unparalleled condition standards, we'll use it as an opportunity to offer our customers a rare vintage frame at a bargain price. 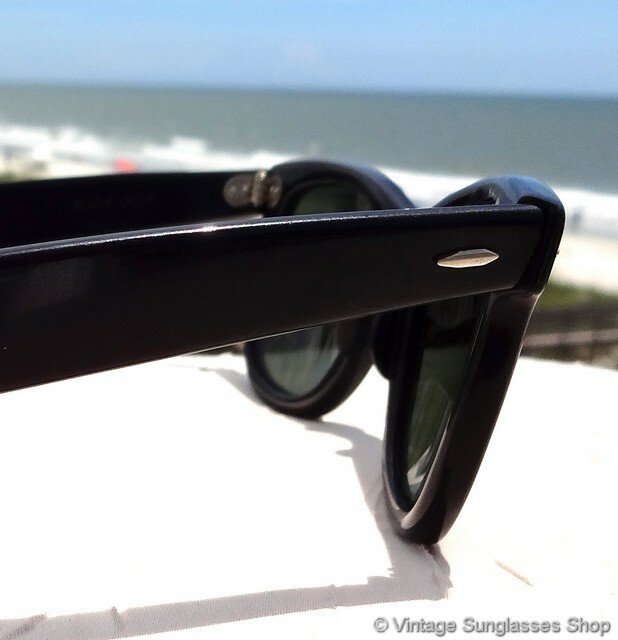 That's the case with these classic Ray-Ban black ebony Wayfarer sunglasses which have some minor lens scratching that left them short of our highest condition standard. 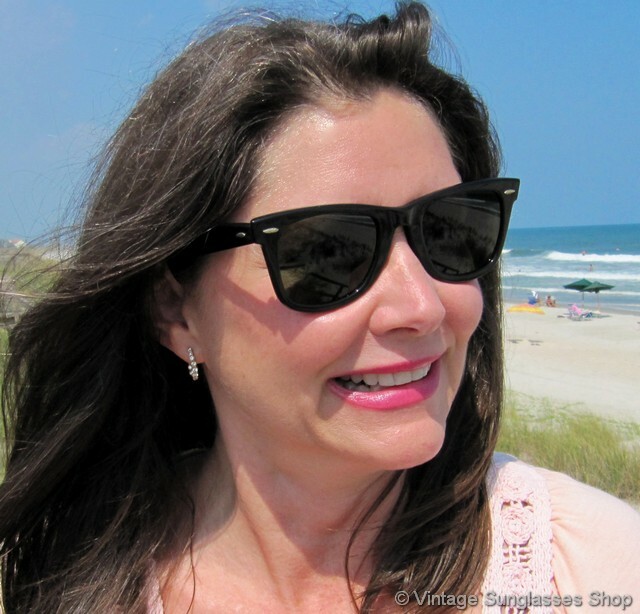 They're hard to see in the sunlight, so it's a rare frame that you can wear as is or replace the lenses with the glass or polycarbonate lenses of your choice at your local optical shop. 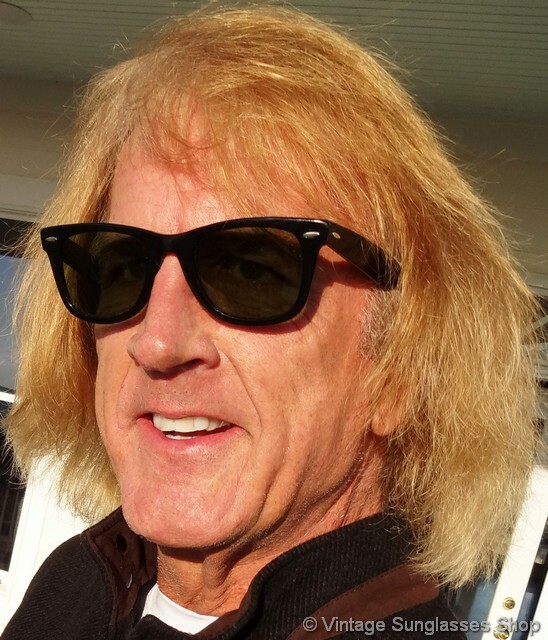 4 Need lenses? 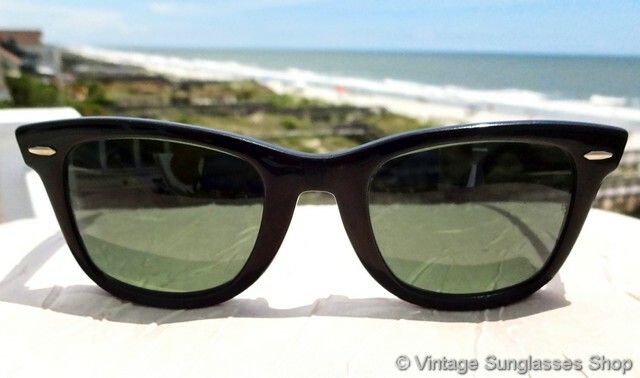 Get a set of original Bausch & Lomb Ray-Ban Wayfarer G-15 mineral glass lenses that were unsold stock from an optical company that went out of business back in the 1980s. 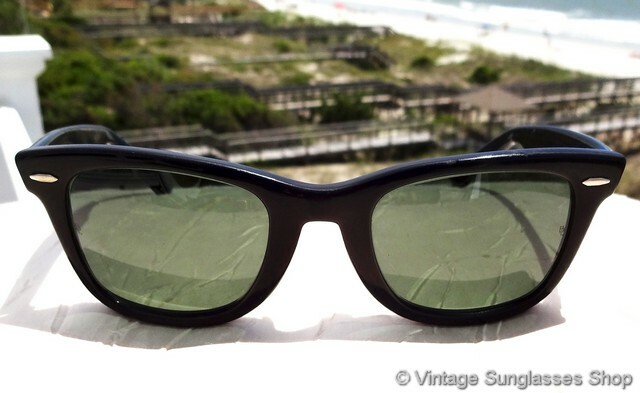 Lenses laser etched BL and in mint condition, and they should fit any authentic B&L Ray-Ban Wayfarer 50  22 frame without the need for any cutting. Rare find. 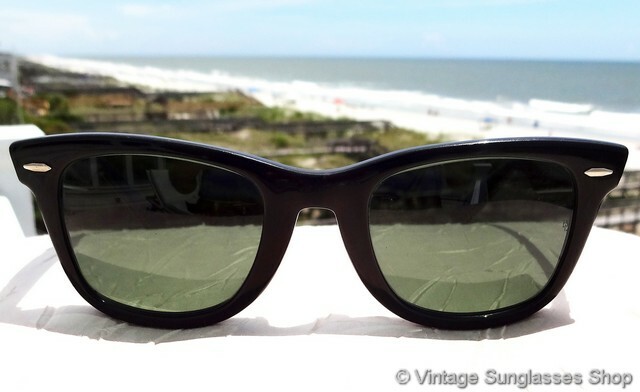 4A Save with original replacement Wayfarer lenses made by Luxottica after they acquired the Ray-Ban brand from Bausch & Lomb in 1998. 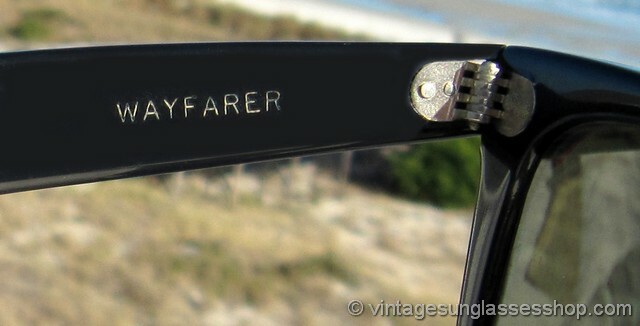 As with the Bausch & Lomb Wayfarer lenses in item 4 above, they will fit any authentic Ray-Ban Wayfarer frame.